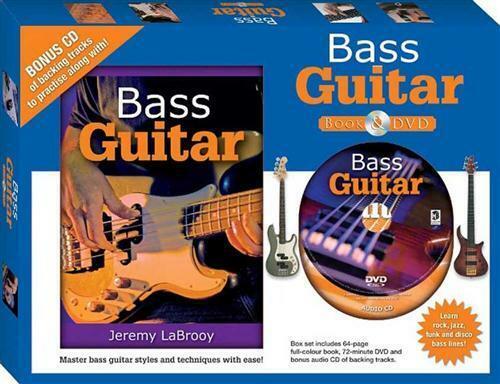 In 2009 a publisher commissioned me to write a book and film a DVD entitled Bass Guitar. Featuring full-color photographs, clear detailed instructions, and comprehensive musical notation and diagrams, this 64-page book guides you thorugh a complete bass guitar lesson. Bass Guitar covers the essentials of music and includes over 80 practice exercises to develop your bass technique. Experienced musician Jeremy LaBrooy guides you through a comprehensive 72-minute bass guitar class. This DVD includes over 80 exercises at different tempos along with on-screen musical notation, so you can folow the lesson and learn at your own pace. Selected exercises are also set to a musical backing track. Also includes backing tracks in MP3 format and futher information about the audio CD, including track names and helpful hints. This audio CD features extended versions of the backing tracks found on the Bass Guitar DVD, so you can practice the exercises along with the music. The bass guitar is an important instrument in modern music, but it’s also great fun to play! Whether you’re just starting out or playing in a band, Bass Guitar has something for everyone. You’ll be guided through the basics, from the parts of the bass and its musical role through to playing different styles of music, such as rock, jazz, funk, and disco. Join Jeremy LaBrooy as he takes you through the fundamentals of playing the bass guitar and reading music. An experienced musician and teacher, Jeremy loves the bass, playing different styles of music with bands and orchestras in a wide range of performance environments. His experience will help to develop your technique and deepen your understanding of music. In this kit you will find information ranging from the practical to the theoretical, including playing techniques, scale degrees and moveable patterns. There are also over 80 practice exercises designed to build your bass-playing skills and have you sounding great in no time. Start your musical journey today and discover the rhythm, melody, and fun of Bass Guitar.